A previoius article extends CFileDialog MFC class, in order to make a File Open or a File Save dialog that automatically filters files, according to available WIC (Windows Imaging Component) codecs. This article presents how to show a similar File Open dialog using IFileOpenDialog interface. This way, it can be used not only in an aplication that uses MFC, but also in an ATL one, even in a raw Win32 or console application that uses basic ATL stuff. cbFilterSpecCount = 1; // we'll use the last one for "All WIC files"
The demo project is a simple Win32 console application that uses the above functions. In a similar way, we can make a File Save dialog using IFileSaveDialog interface. This article presents just proof of concepts. IFileOpenDialog offers much more methods to customize the dialog according to specific needs. And of course, a more elegant job can be done by writing some C++ wrapper class(es). For the future, I intend to integrate WIC File Dialogs in WIC Wrapper Library also presented in this blog. 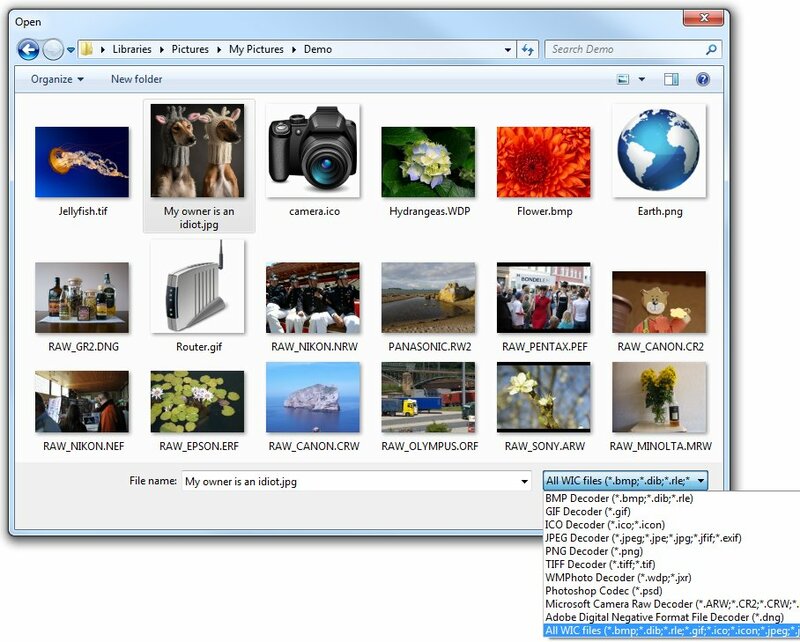 The built-in WIC decoders deal with the following image file formats: BMP, GIF, ICO, JPEG, PNG, TIFF and WMPhoto. However there are many other decoders that can befound over the internet. Just to mention two free ones: Microsoft Camera Codec Pack and Adobe DNG Codec for Windows. How to enumerate WIC codecs? What is Windows Imaging Component (WIC)? This entry was posted in ATL, MFC, WIC and tagged WIC, wic codecs, windows imaging component on 2014.03.29 by Ovidiu Cucu. Thanks for this very useful code! However, I found that in my case hr = pIFileOpenDialog->Show(hWndOwner); often takes very long to respond after you have chosen a file and clicked ok in the dialog. It takes several seconds for this method to return a result.Funny thing is, sometimes it works instantly. It’s independent on what file I chose (codec/format, etc). Do you have any idea what this could be about?